Fashion house Hermès is known for their high end scarves... or at least that's how I'm familiar with the French company. I remember scores of uber wealthy ladies wearing the accessory in the 80s and even more ladies of not-as-much means wearing knockoffs of the printed scarves. So, you can well imagine my surprise when I came across one of their latest designs intended for those same ladies of leisure and it was the nerdiest piece of haute couture EVER. 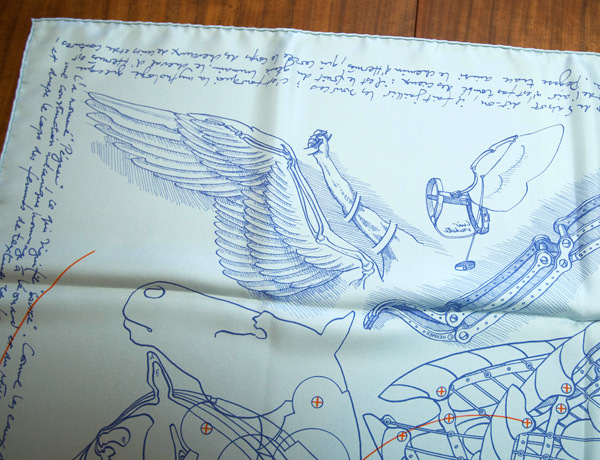 Blueprints for a mechanical pegasus featuring backwards writing ala Leonardo da Vinci. People, did you hear me? Blueprints. Mechanical. da Vinci. PEGASUS. 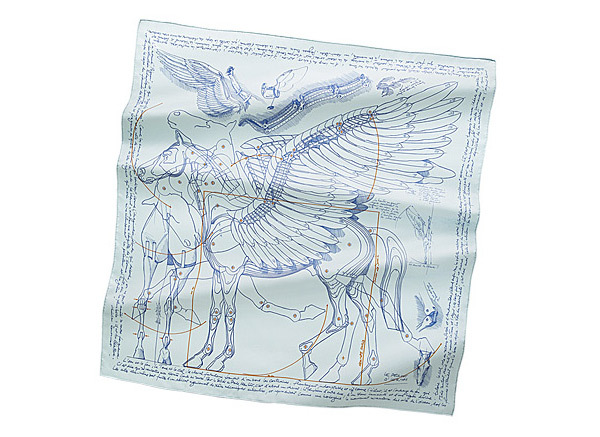 The silk twill scarf is available in six colors and will only set you back a meager $385 without tax. Even more photos of the scarf are available on design site NotCot. Woah, why do I kinda want this? Oh and did you see the person at NotCot said they were looking at framing options? How cool would that be to have on your wall?